Duke is Shuko's bodyguard and uses the art of Moukohisouken, a Chinese fighting style also known as the shadow murder. 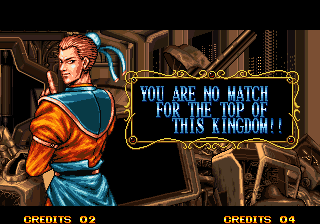 Duke is the right-hand man of Koga Shuko (and the sub-boss of the game). Duke is a ruthless fighter, willing to murder without reserve. He enjoys causing pain to others, especially pain that merely tortures someone rather than killing them. Duke was the final boss in the Super NES game Super Double Dragon. So Duke is the "Smithers" of Double Dragon.... He does look a little like Smithers (something about his eyes and face shape, I dunno). lol. I guess some of his special moves are halfway decent, but visually... he's pretty bland. *In best Chef Ramsay voice* : "It's BLAND!!!" Duke's costume isn't terrible, and I actually like his fighting stance. However, I don't think his name suits him very much. Just my two cents.